Hillary Clinton Surpasses Donald Trump In Popular Vote Tally: Shades Of 2000? : The Two-Way Hillary Clinton is poised to become the fifth presidential candidate to win the popular vote but lose the election. Shortly after noon Wednesday, she led Trump by 238,156 votes. Democratic presidential nominee Hillary Clinton speaks to Florida voters Oct. 30 at a Baptist Church in Miami, Fla.
Democratic presidential candidate Hillary Clinton finds herself on the wrong end of an electoral split, moving ahead in the popular vote but losing to President-elect Donald Trump in the Electoral College, according to election results that are still being finalized. As of midday Thursday ET, Clinton had amassed 59,938,290 votes nationally, to Trump's 59,704,886 — a margin of 233,404 that puts Clinton on track to become the fifth U.S. presidential candidate to win the popular vote but lose the election. Neither candidate got more than 50 percent of the vote: As of noon Wednesday, Clinton stood at 47.7 percent and Trump at 47.5 percent. "Trump crossed the 270 electoral vote threshold at 2:31 a.m. ET with a victory in Wisconsin," as NPR's Carrie Johnson reported last night. Addressing the results publicly for the first time Wednesday morning, Clinton said that she had offered to work with Trump as he assumes the presidency, saying, "I hope that he will be a successful president for all Americans." Clinton also acknowledged, "This is painful — and it will be for a long time." 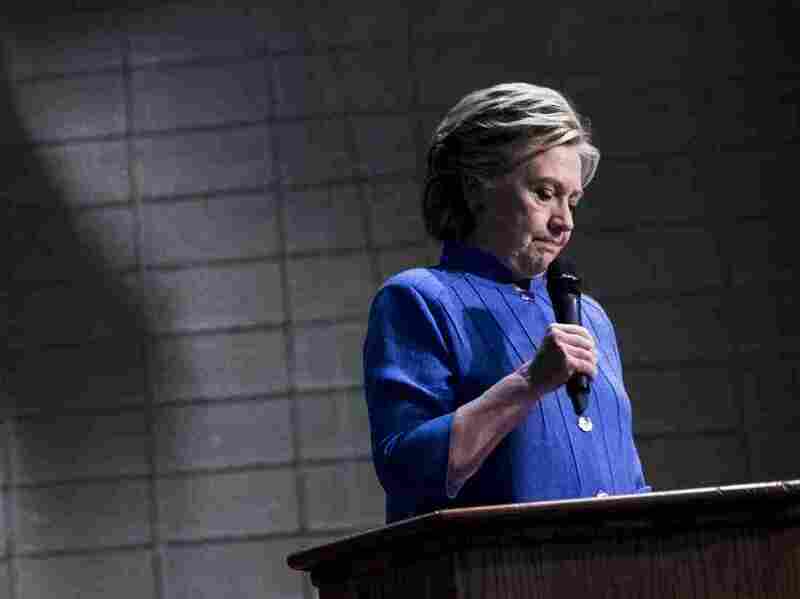 Of the election's results, Clinton added that the country's electorate had proved to be "more deeply divided than we thought." If the final tally follows the current trend, the result would mark the second time in the past 16 years that a Democrat has lost a national election while winning the popular vote. In 2000, Al Gore narrowly won the popular vote against George Bush, but he lost the presidency by five electoral votes in a hotly contested result. Because of how the Electoral College works, it's theoretically possible for a candidate to win the White House with less than 30 percent of the popular vote, as NPR's Danielle Kurtzleben recently reported. Discussing the 2000 election, Danielle noted that despite the split outcome, that race "also has the electoral-vote margin that most closely reflects the popular-vote margin." Danielle added, "In that sense, one could call it one of the 'fairest' elections in modern politics." "The closest Congress has come to amending the Electoral College since 1804 was during the 91st Congress (1969–1971). H.J. Res. 681 proposed the direct election of a President and Vice President, requiring a run off when no candidate received more than 40 percent of the vote. The resolution passed the House in 1969, but failed to pass the Senate."